OnePlus One owners that have been waiting for their promised OxygenOS upgrade will be pleased to know that the Chinese company has just released the update. Initially slated for a March 27 launch, OxygenOS has been delayed due to “extra quality control” and OnePlus stated that it will offer daily news updates on the status of the upgrade. Along with the delay of the update OnePlus offered five 64GB OnePlus One smartphone to 5 lucky winners chosen from their forum users, as compensation for postponing OxygenOS. One week after the delay, the Chinese company came forward with an announcement confirming the release of the highly anticipated OxygenOS for OnePlus One. The new OS is based on Android 5.0 Lollipop operating system and brings lots of new features and improvements to OnePlus One owners. In that regard, OnePlus claims all the features included in OxygenOS aren't there just for the sake of differentiation. Those who developer this ROM have decided to put things like performance and battery life over other gimmicks and bloated features. According to OnePlus, they have added lots of important features, which are subtle and meaningful. That seems to be the Chinese company's philosophy behind its OxygenOS. Keep in mind that OxygenOS is not delivered OTA (over the air), instead you will have to head over to oneplus.net/oxygenos and download it from there. 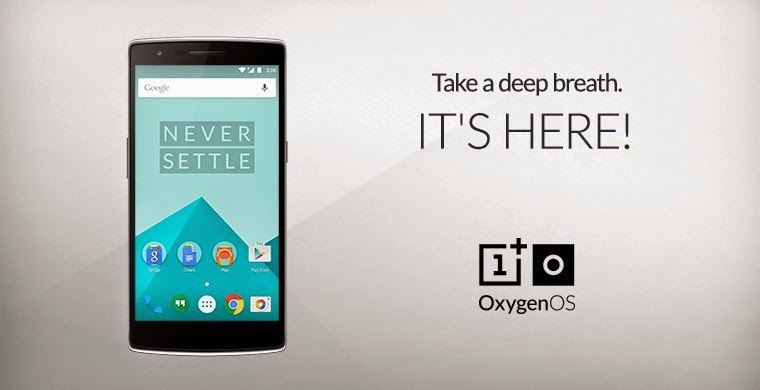 OnePlus also offers instructions on how to flash OxygenOS on the OnePlus One smartphone. In other news, those who own OnePlus One smartphones powered by CyanogenMod will have to wait a little longer for their update, which is now going through certification.